So here I was, standing in the manager’s tiny office at Western Sizzlin’ Steak House a couple of weeks before Christmas 1974, wondering if I was about to be fired after my first evening on the job. I sank into the dented folding chair across from Mr. Williams’s desk. “Am I in trouble?” I stammered. Dumbfounded, I stared at him. “There wasn’t much to learn,” I finally said. Was he kidding me? If two-and-a-half years of college hadn’t prepared me to count croutons and memorize a list of four dressings, my parents were wasting a whole lot of money on my tuition. I didn’t say that, of course. I just thanked Mr. Williams and said I’d see him tomorrow. Crystal, the assistant manager who’d been the one to train me in salad girl skills, was standing just outside the office door as I emerged. “What were you doing in there?” she asked in an accusatory tone of voice. “Nothing.” I shrugged and headed for the lockers to get my coat. From that moment on and for reasons I’ll never understand, Crystal seemed to have it in for me. She began taping up signs in the kitchen. Signs that said things like MAKE SURE REFRIGERATOR DOOR IS CLOSED and PUT USED PAPER TOWELS IN TRASH CAN and MOP UP ALL SPILLS. She always signed them “The Mangement,” which I took to mean “The Management.” Wisely, I chose not to point out the misspelling to her. Or to ask why we needed those stupid signs. Crystal found fault with everything I did. I put too much salad dressing on one customer’s lettuce, not enough on another’s. One night as I was helping a co-worker wrap potatoes in aluminum foil, she snatched the foil from my hands. “This,” she said, “is how you wrap a potato.” Then she proceeded to do it exactly the same way I had. The last straw came two days before the job was scheduled to end. 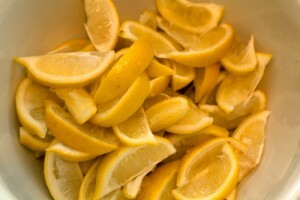 Just before the restaurant was to close for the night, Crystal put me to work slicing lemons for iced tea. Then she stood over my shoulder, watching and criticizing. Finally, I’d had enough. “I’m twenty-one years old,” I told her, “and I don’t need MANGE-ment to tell me how to cut a lemon!” With that, the knife slipped and nicked the index finger of my left hand. Blood spurted everywhere. Crystal screamed. Mr. Williams came charging out of his office. When he saw what had happened, he pulled a none-too-clean handkerchief out of his pocket and tried to wrap it around my finger. And to this day, I can’t slice a lemon or hear someone ask for Thousand Island dressing without remembering that long-ago Christmas and my short-lived career as a Sizzlin’ salad girl.